“I made a very basic little field with two different types of grass on it and a few bits of timber thrown together. 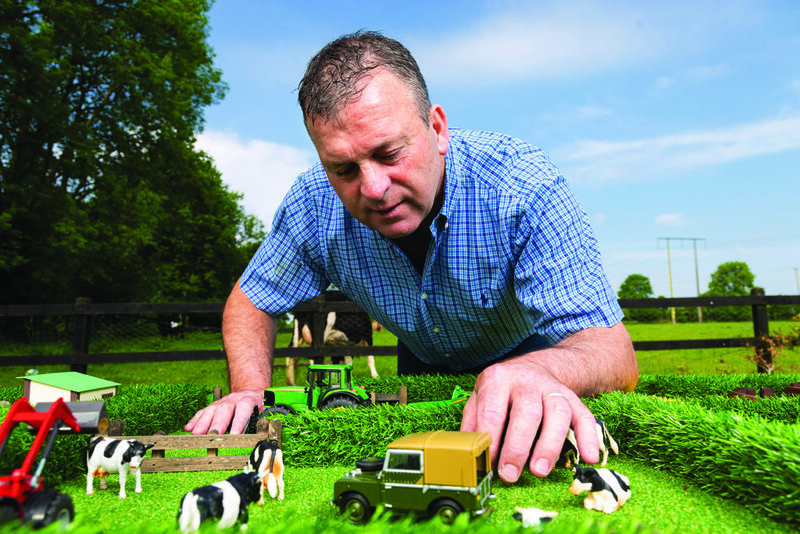 It wasn’t great to be honest but I’m very proud of it now because it’s what gave us the idea,” says Padraic Cuddy whose toy company, aptly named The Field, was created when he saw how much his son Tommy enjoyed playing with the original field. Tommy was just three years of age when his dad made him the first model but four years later The Field is nothing short of a home-grown success story. Before 2009, Padraic was working as a civil engineering contractor however when the recession hit and the downturn came he found that he couldn’t compete with bigger companies and this led him to look elsewhere for work. “We started an artificial grass business in Portugal in 2010 and lived there for 10 months, but my wife was at home and that was difficult to say the least. At the end of 2010 we brought Class Grass here to Ireland and it has sort of got us back on our feet and we’ve done very well,” Padraic says, adding that between September 2011 and April 2014, he and his wife Anita had two children, Tommy and Ava. “A few months before Christmas in 2014, Anita said to me, ‘Will you make a little field for Tommy?’ because he liked his tractors and farming and all that.” Padraic used spare pieces of material from Class Grass to create the prototype that sits in the Cuddy home to this day and ‘will never be thrown out.’ “Tommy used to sit into his field and he played with it more than he played with anything else. He didn’t watch television as much, he would be driving his tractor around the field and it just changed the way he played with [his toys]. In early 2015, Padraic and Anita began the process of naming their product and discovered that they were able to register and trademark it in Europe. Next they began to design the product and how it would be presented which took them up until the autumn of that year where they officially launched The Field at the National Ploughing Championships in Ratheniska, county Laois. “It went down very well, we got a lot of media attention. Then we put a package together of everything that we had done so far in its very short life and we sent it up to RTÉ for The Late Late Toy Show,” Padraic says of what would be the first of four appearances on the show. “Three weeks before the Toy Show the producers asked us to send up another one of them and that was very exciting because it now looked like our toy was going to actually feature. It featured with the rapping farmer Fionn Molloy from Tullamore in county Offaly and it kind of spiralled out of control for us for the remaining part of that December. Our sales were very strong and we still had only one product. Listening to what the children want to play with and taking feedback from shopkeepers on board plays a very important part in helping the business to grow and keeping their customers happy. It’s also very much a unisex product that young girls can enjoy just as much as boys. “Girls can use it for picnic areas and all that kind of stuff as well. The kids tell you the story and you have to listen to them. It’s all coming from the imagination of the children and that was the reason behind some of the products we have brought out. Using their imagination and creativity are the two core words of what The Field is all about.